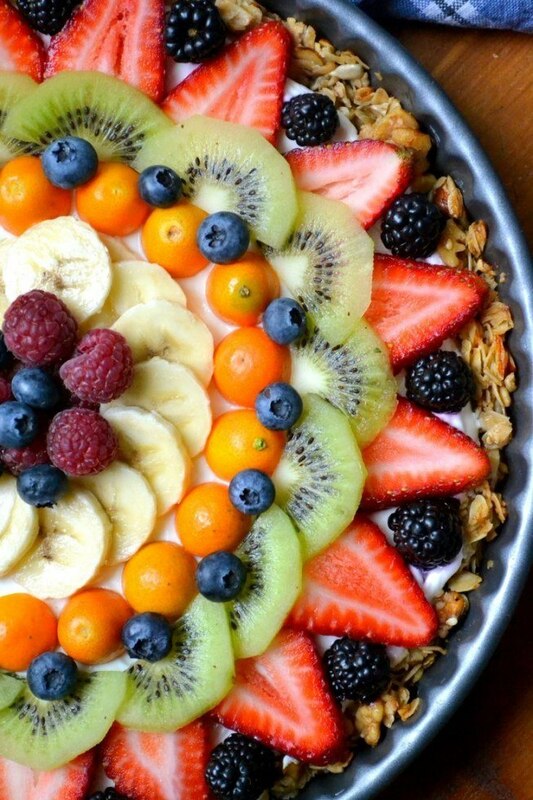 This Beautiful Breakfast Tart has a gluten granola crust filled with thick Greek yogurt, and topped with a colorful sunburst of fresh juicy fruit. Yes it looks too beautiful to eat, but dig in anyway ~ it may be beautiful, but it's still breakfast! Mix the oats, nuts and seeds, melted butter, honey and vanilla together in a bowl until everything is thoroughly coated. Press the mixture into a greased 10" tart pan with a removable bottom (or a pie plate). Use a measuring cup to help press the granola evenly across the pan and up the sides. Bake for about 15 minutes, until lightly golden. Let cool. You can make the crust ahead if you want to and fill it the next morning just before serving. Fill the tart with Greek yogurt, and smooth out evenly.